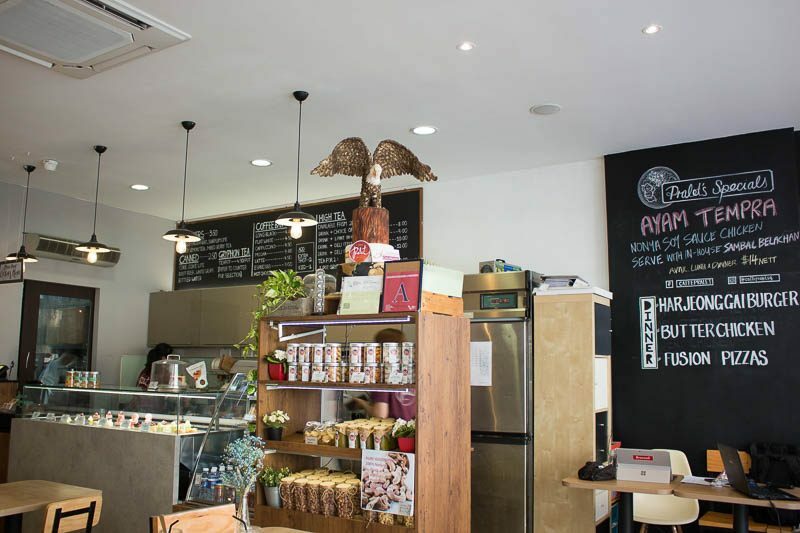 Tiong Bahru is well-known for its good food, especially with the influx of cafes over the past few years. Along Eng Hoon Street lies Caffe Pralet, a cafe that has been operating for the past 13 years. I’ve been to several cafes in this area but this place never caught my eye as it’s located in a more secluded part of Tiong Bahru. 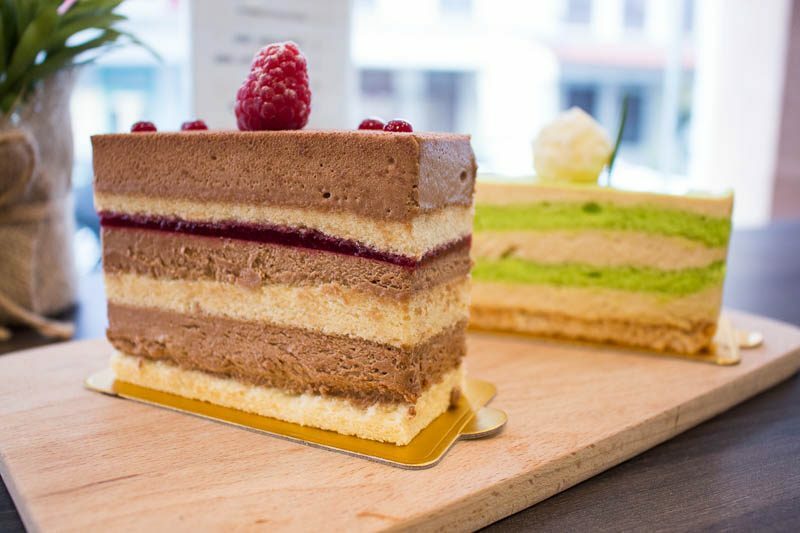 I happened to chance upon Caffe Pralet online and the menu intrigued me, so I decided to check it out for myself. I was lured in by the comfortable and calming ambience, and the place was simply decorated with wooden furniture and blackboards for a slightly nostalgic feel. Every table also featured a potted plant, adding relaxing and homely vibes. I managed to speak to the head chef, Timothy. He mentioned that his mum is a chef herself, so he grew up helping out in the kitchen. 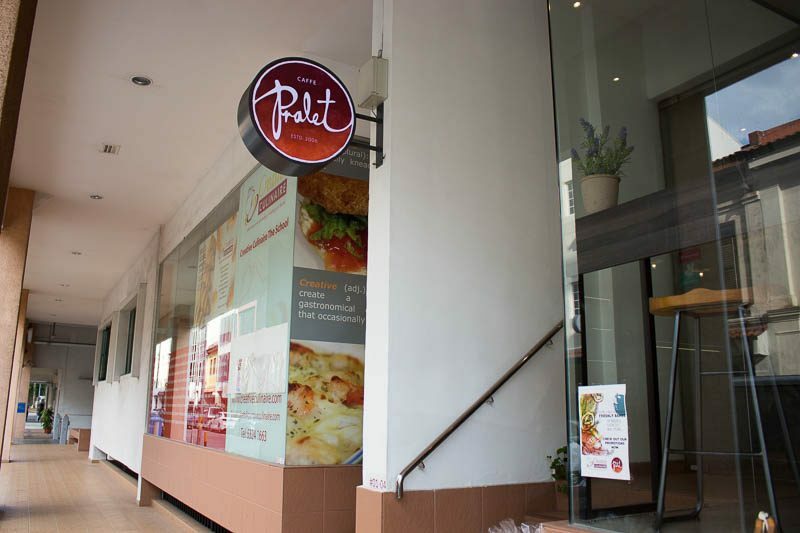 Developing his passion and interest in fusion food, he incorporates Asian flavours into delicious and unique dishes here in Caffe Pralet. 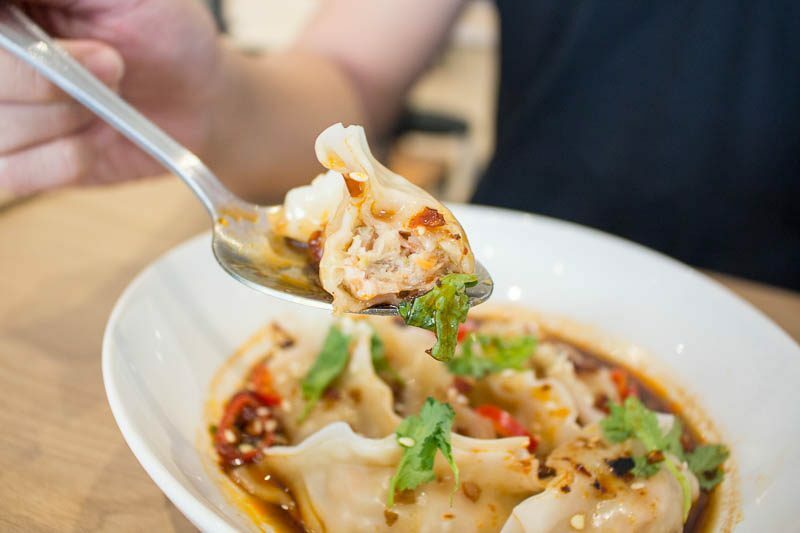 My first dish was the Sichuan Spicy Seafood Dumplings (S$10). At first glance, they reminded me of a zhng-ed version of Hong You Chao Shou (Sichuan spicy wonton in red chilli oil). I was pleasantly surprised by its silky-smooth and thin skin. Enclosed within was a decently-packed filling predominantly made out of swordfish and tasted amazingly fresh. The sweet fish was distinct, complete with a wholesome meatiness to it. It went well with the slightly spicy and sour sauce, which is a blend consisting of peppercorns, chilli oil, vinegar, and other ingredients. 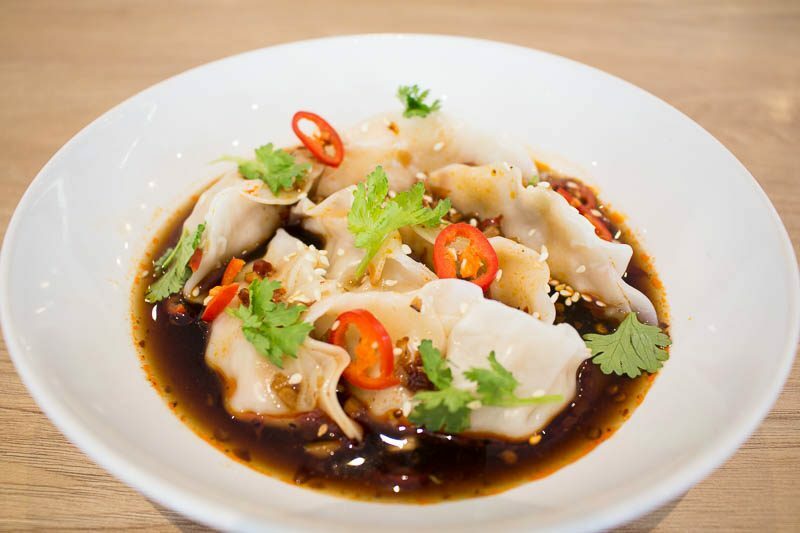 The sauce brought out the flavour of the dumplings, which made for an appetising starter. 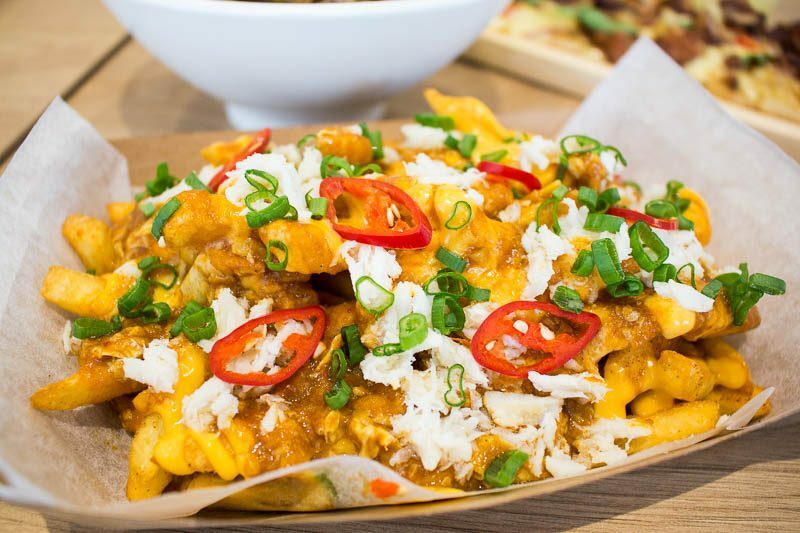 Tempted by the name, we got another starter, the Chilli Crab Cheese Fries (S$12). 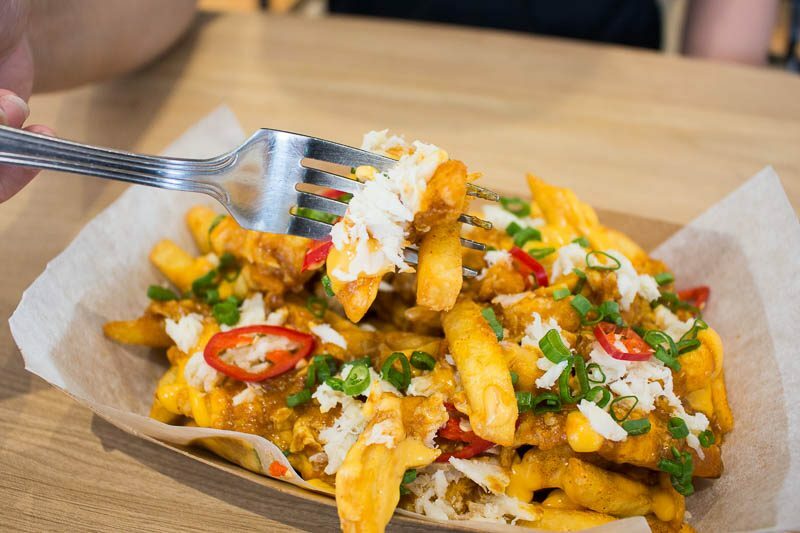 I was intrigued by the fact that they used 100% shredded backfin crab meat, as opposed to most chilli crab dishes that have very little crab or processed crab meat. 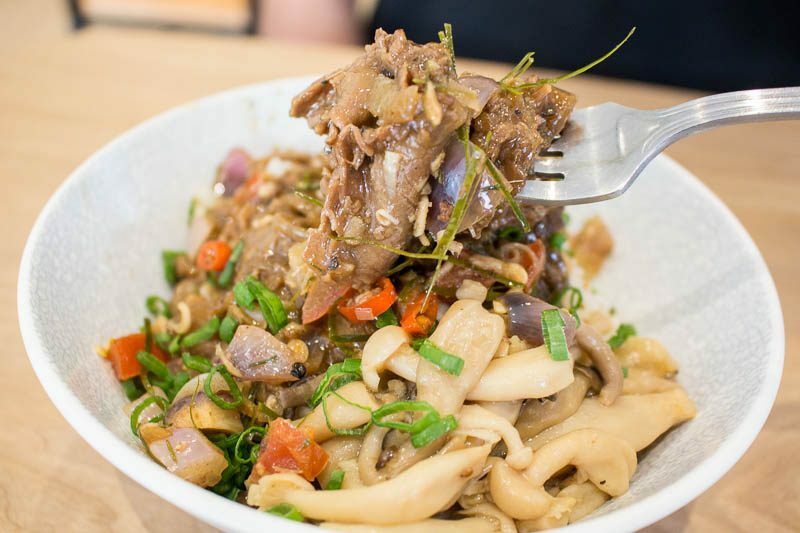 Those who love a good Insta-worthy dish, this is the one for you! It looked so tantalising with the vibrant contrasting colours. Caffe Pralet also added large handfuls of succulent crabmeat on top of the fries, along with a generous drizzle of sauce. They manage to top the dish with just the right amount of sauce, preventing it from getting too jelak. The seemingly jarring flavours harmonised and I appreciated that the homemade chilli crab sauce wasn’t overly thick, allowing the natural sweetness of the crab to shine. The Kai Phrik Kwan (S$17) was my favourite. 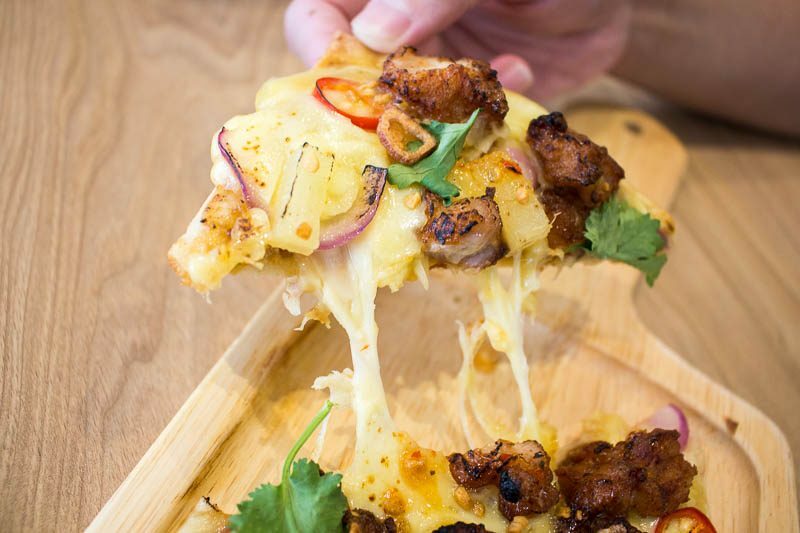 This pizza consists of a peanut sauce base, topped with Thai-style sweet chilli chicken, a four-cheese blend, as well as pineapples, red onions, shallots, coconut yoghurt, chilli, and coriander. It may seem slightly overwhelming, but all the flavours complemented each other perfectly. 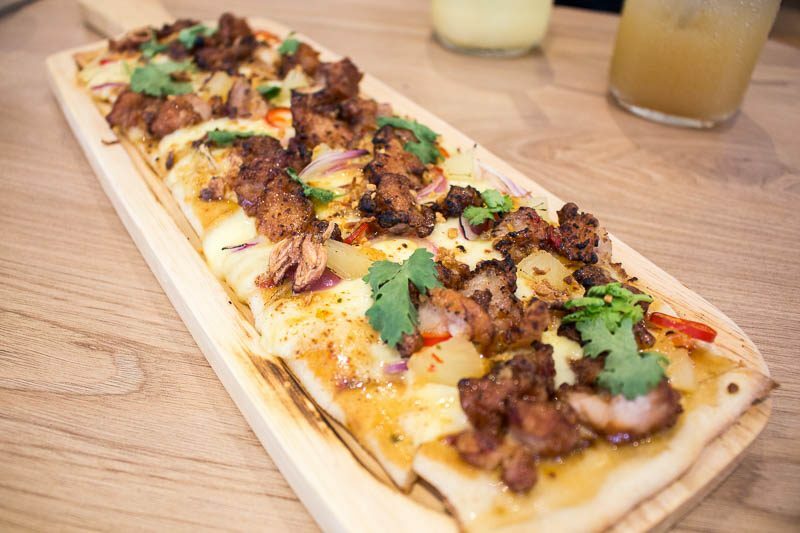 The handmade pizza doughs were relatively thin-crusted and chewy. The chicken bites were juicy and tender, with a nice crisp skin that had lil’ bits of char. The pineapple chunks were delightfully sweet, and the chillies added a hint of heat. For added texture, the shallots also gave a nice crunch factor. The peanut sauce was subtle but definitely helped to tie the ingredients together. 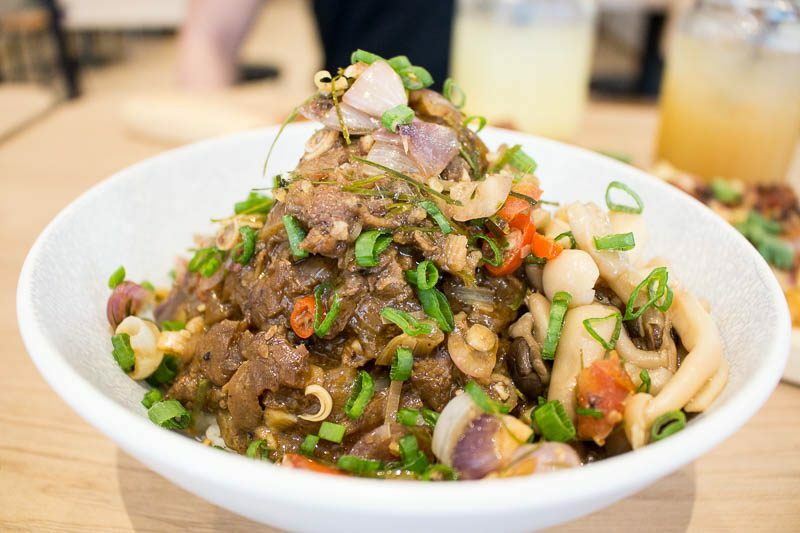 The last main we got was the Sambal Matah Beef Gyudon (S$15), which was aromatic and immensely flavourful. The stewed ribeye slices were almost melt-in-your-mouth tender. 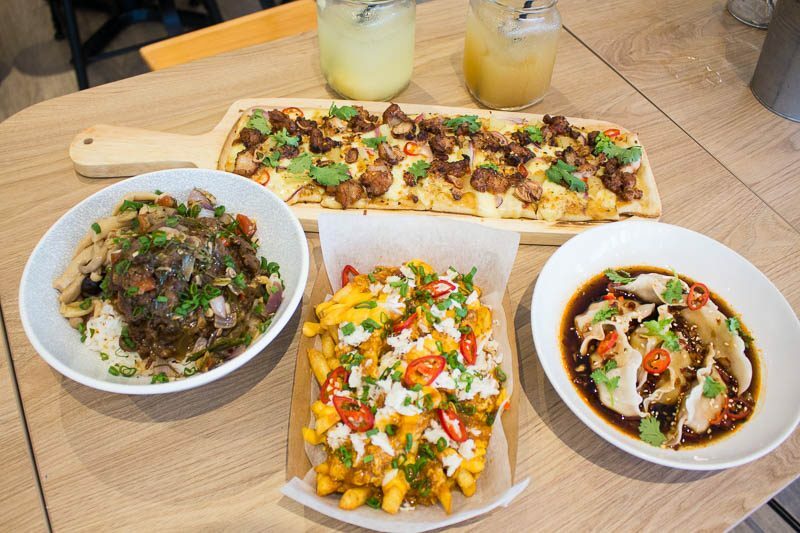 It was sweet, spicy, savoury, and herbaceous all at once. The spices were really strong too, enhanced by the raw Balinese sambal. The unique depth of flavour was something I have never had before. However, for those who prefer something lighter for your palate, this may not be the dish for you. I appreciated the truffle shimeiji mushrooms, which helped to cut through the heavy flavours. As they were set up by the specialised baking school, Creative Culinary, I simply had to try their unique cakes too. I got a taste of two cakes, the Oolong Raspberry (S$6) and Gula Melaka Mousse (S$6). 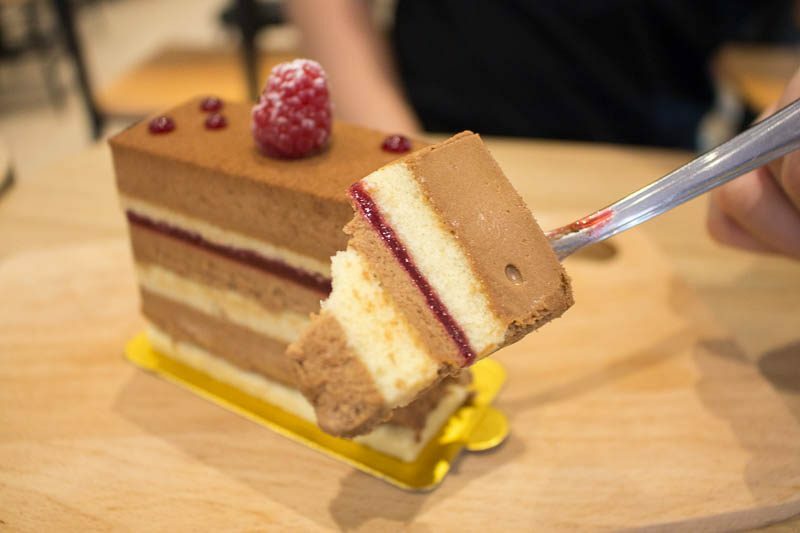 The former was a towering cake with seven layers, all intricately stacked upon one another. The first note that hit me was the sweetness of the raspberry. It was the dominant flavour of the cake, overriding the oolong. The oolong-infused tea cream in the dark chocolate mousse was actually prominent on its own, and the raspberry coulis could have been lighter for it to be a perfect dessert. The Gula Melaka Mousse was light and refreshing, which I preferred. 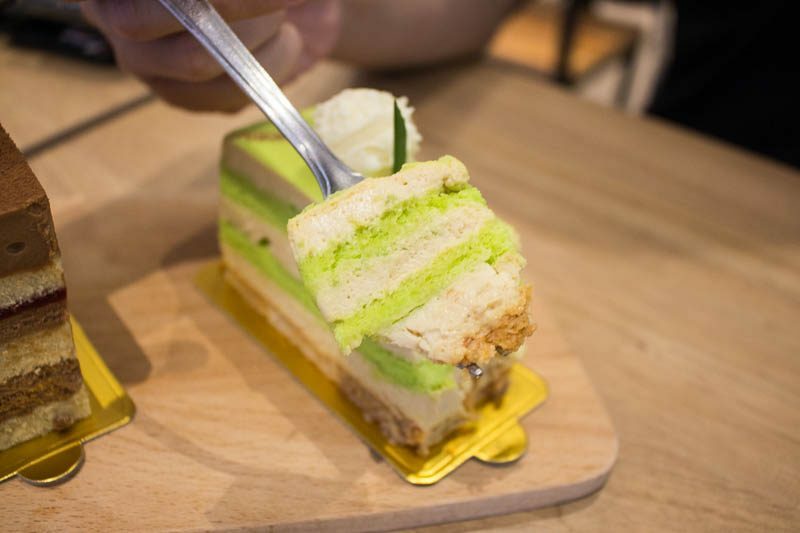 The pandan sponge was moist, and the gula melaka mousse was not too sweet. I did feel the sponge could have been fluffier for a more varied texture, but I really liked the addition of coconut at the bottom. Caffe Pralet has been one of the best cafes I’ve been to. Based on the dinner menu I’ve tried, you are in for a treat. I love how their concoctions are boldly different, but they taste so good! I’ll definitely be back to try out their lunch offerings soon.